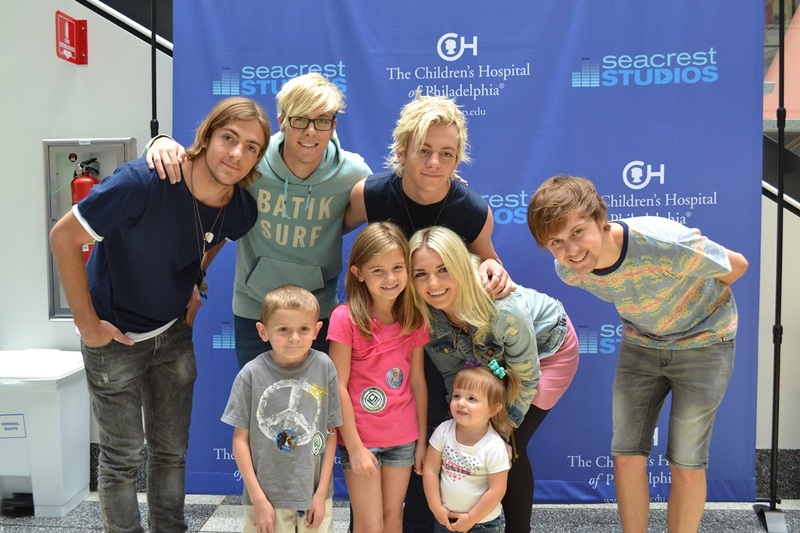 Recap Written By Seacrest Studios Intern, Christian Waites Patients and staff at the Children’s Hospital of Philadelphia were excited to welcome the dynamic band, R5 to Seacrest Studios. This group is known for their lead singer, Ross who also plays on Disney’s Austin and Ally and Teen Beach Movie. Before the interview kicked off, members of the band seemed very eager to perform their songs and answer questions from their fans. In fact, they did not only warm up before performing, but also gave fans the opportunity to engage in conversation with them by teaching them about their instruments. While the members of R5 may already seem like the most down to earth band, things get even better throughout the entire interview. In the beginning of the interview, they explained they all started singing at a very young age. To keep them out of trouble, their parents decided to put them in a band. The fans were shocked to hear that they also have one more edition to their family, which is their younger brother who opens up for them on tour. Many fans were excited when they heard the band perform their hit single, “(I Can’t) Forget About You”. Ross explained that there were two video versions for the song. There is one live video that airs on Disney and a more narrative video for other stations. The band also revealed that the more narrative video was extremely fun to shoot because they filmed it in Japan. The members of the group also admit that although they love to travel and perform for their fans, they also appreciate much of the down time that they do get. According to the group, they simply like to go to the movies and hang out with friends when they are at home. Rydel describes hanging with the boys of the band by stating, “their like always bouncing off the walls and making jokes”. To wrap up the interview, the band sang another one of their famous songs. Before leaving the studio, R5 signed autographs and took pictures with the fans. Many of the fans were thrilled for the opportunity to meet the band. Some fans even got a little emotional after meeting the group. We would like to thank all of the members of R5 for making this a wonderful experience for the fans down here at the Children’s Hospital of Philadelphia.